292 in stock Need More ? 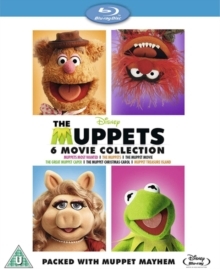 Boxset of six films featuring the characters created by Jim Henson. 'Muppets Most Wanted' (2014) is a musical comedy sequel starring Tina Fey, Ricky Gervais and Ty Burrell. While on a European tour Kermit the Frog (voiced by Steve Whitmire) is mistaken for a Russian jewel thief called Constantine (voiced by Matt Vogel), to whom he bears a striking resemblance, and is thrown in jail by prison officer Nadya (Fey). Seeing an opportunity for a new life Constantine poses as Kermit and joins the rest of the Muppets on their tour. 'The Muppets' (2011) stars Jason Segel as the human brother of Muppet Walter (voiced by Peter Linz) who Walter approaches for help in raising ten million dollars to save the vaudeville house where the Muppets used to perform. Amy Adams also stars. In 'The Muppets Movie' (1979) Kermit (voiced by Jim Henson) leaves behind his swamp and heads for the big lights of Hollywood to fulfil his dream of becoming a star. Along the way he becomes involved with the dazzling Miss Piggy (voiced by Franz Oz), the charming Fozzie Bear (also voiced by Franz Oz) and Gonzo the Great (voiced by Dave Goelz), encountering such celebrities as Orson Welles, Steve Martin and Bob Hope. In 'The Great Muppet Caper' (1981) the Muppets travel to London to investigate the disappearance of Lady Holiday's jewels, Miss Piggy (voiced by Frank Oz) is framed for the theft. 'The Muppet Christmas Carol' (1992) is the Muppet's version of Charles Dickens' immortal festive tale about a bitter old man who is shown the error of his ways. 'Muppet Treasure Island' (1996) sees the Muppets go on an adventure on the high seas in their version of the famous pirate adventure. Tim Curry stars as Long John Silver alongside Gonzo (voiced by Dave Goelz), Kermit (voiced by Steve Whitmire) and Miss Piggy (voiced by Frank Oz).